TAOISEACH LEO VARADKAR has said that the Department of Justice has a “lot of problems” and that he wants to get to the truth of the recent controversy over departmental emails. Speaking on RTÉ’s Marian Finucane show, the Fine Gael leader said that he was only made aware of the full extent of the emails on Monday afternoon and said the truth of these matters would be found by the Disclosures Tribunal. He also said that the behind-closed-doors discussions with Fianna Fáil “wasn’t some poker game with Micheál Martin” and that the controversy with Frances Fitzgerald became a “feeding frenzy” over the past week. Emails released by the Department of Justice earlier this week showed that Fitzgerald had “noted” the legal strategy being employed, and that the email had been sent to her on three separate occasions in May 2015, when Fitzgerald served as Justice Minister. Despite having the support of Varadkar, she stepped down on Tuesday with the opposition threatening to trigger an election if she didn’t go. The Taoiseach was also critical of civil servants in the Department of Justice in the wake of the recent controversies. He said: “It is important to acknowledge that departments that have difficulties – and justice has a lot of them – but good work is still done. I’m not tarring an entire department with one brush… but there were evidently failings. I hope this episode will get the message across – if you’re passing information to minister, it needs to be correct. Facing the first real crisis in his time leading the country, Varadkar said he didn’t feel like he was out of his depth. He said he had worked all last weekend with Micheál Martin in a bid to avoid a general election, and more he works with him, the “more [they] understand each other”. It wasn’t some poker game with Micheál Martin… It wasn’t until Monday afternoon we had the full facts. 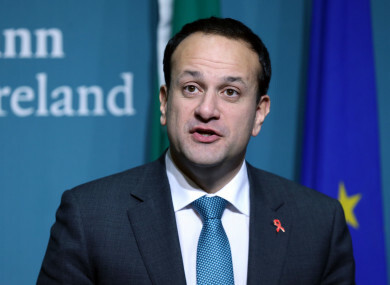 Varadkar also said that he felt like his government could actually last longer than expected, as the recent scandals had helped to “focus minds”. On the issue of Fianna Fáil politicians celebrating in the Dáil bar when it was announced that a no-confidence motion had been tabled against Fitzgerald, he said that it “highlighted a type of politics [he doesn't] like”. Turning to the Brexit negotiations, Varadkar said that he doesn’t think Ireland need to use its veto on any trade deals as “we have 26 countries behind us”. He was also critical of the criticisms being made by British politicians. “If they want to move on to phase two, they’ll have to say yes to something,” he said. One thing I understand about politics, when people don’t want to deal with you on substance and on facts, they attack you personally. Email “Leo Varadkar on political crisis: 'It wasn't some poker game with Micheál Martin'”. Feedback on “Leo Varadkar on political crisis: 'It wasn't some poker game with Micheál Martin'”.